Being from the south of the country I had never visited the Frysian Islands in the north, in 2013 it finally happened. This was a camping trip that spanned 3 days over a long weekend in the summer. With our friends Jo and Mene we were a group of four. Over several months this trip had been planned, postponed, changed and eventually actually happened. Just as we left our houses and were in the city getting some supplies it started to rain. The weather forecast was not that great for the weekend, but it should be better up north. The goal was to explore The North of the Netherlands. 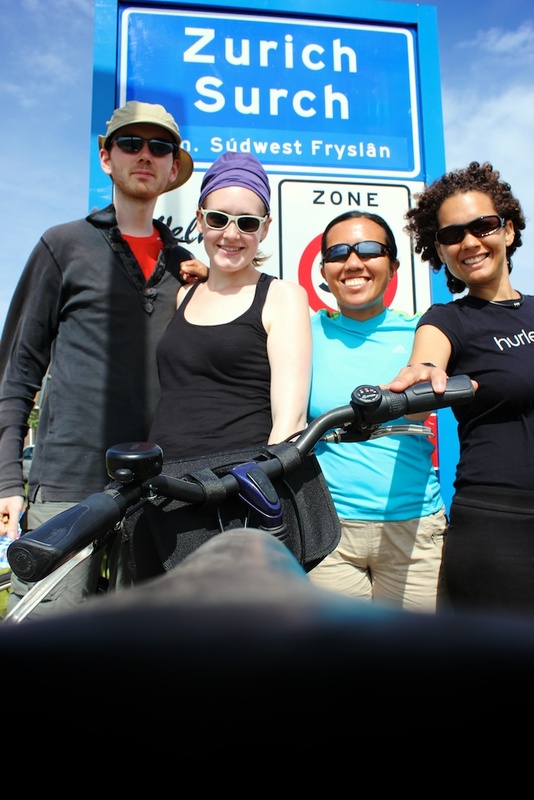 We took our four bikes on the train from The Hague to Den Helder. There is no direct train so we had to change on the way. In the second train there was not enough space left so we had to put them in different carriages. Map displaying the route of this cycling trip. Significant events mentioned in this article are displayed. We arrived in Den Helder on Friday afternoon. It's in the northern tip of North Holland, and the very last stop. Because a water line to the island of Texel had broken and there was supposedly a shortage of water we got some extra water from a shop and left for the ferry. While going there we saw one of the water trucks that were supplying the island going on the ferry as well. 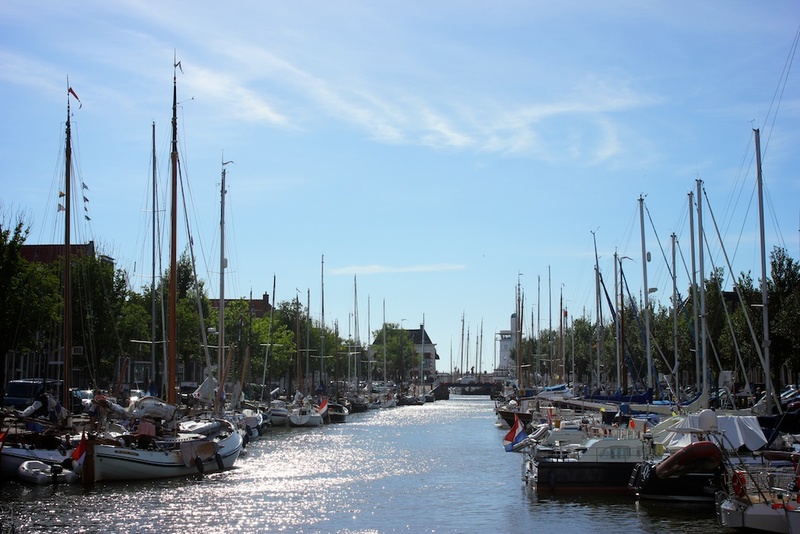 During the summer there are many boats leaving each day, and you can buy a ticket in Den Helder. It is always a return ticket because it is also the only way to get off the island, as we found out on the way back when we were looking for the ticket machine. We arrived on Texel and cycled to Den Burg, the largest town on the Island. We first stopped at the tourist information to make a plan for the weekend. One of the ideas was to go by boat to the next island; Vlieland, however this is not as easy as it sounds. In the summer there is a boat, but only twice a day, you have to make a reservation by phone at least a week in advance if you want to bring a bicycle and can only pay in cash. For the return there is another procedure where you cannot make a reservation and have to pay with your debit card. We called, there were some spaces on the boat that would leave from De Cocksdorp at the north end of the island, but we had to be there tomorrow at 10 o'clock in the morning. In Den Burg there is quite a of activity, there is a super market and places to eat, since it was dinner time we had some dinner and continued cycling up north towards De Koog, another touristic hotspot. On the way we checked out a small camping, it was not quite what we were looking for, and we still had some hours of daylight so kept going. The island is very bicycle friendly with wide cycling paths. It's ideal for cycling with young children, which is something many tourists do. While on the island we passed many families with swiveling kids. I had to hit the brakes really hard when a child swerved over right in front of me. Usually you can see them coming from far away, but I would recommend to pass them slowly. We were now on the west side of the island which is a national park. 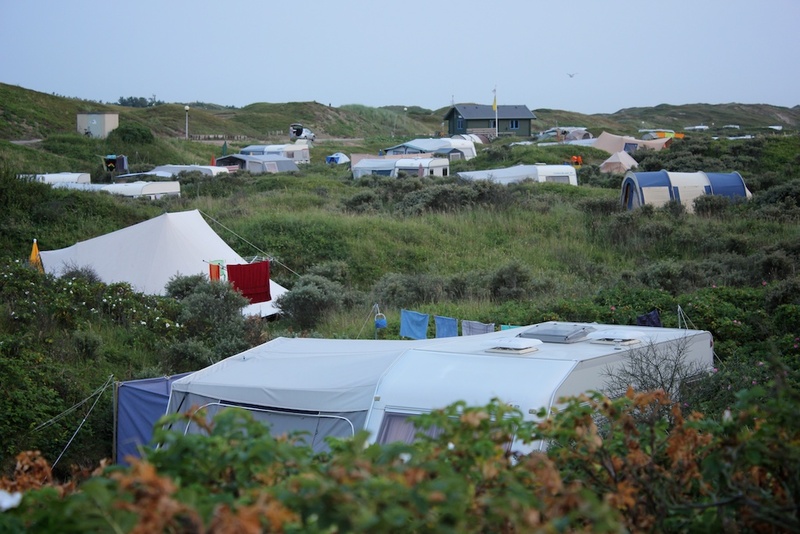 We continued to De Koog where there was an enormous camping in the dunes. They a few places available and we set up our tent in the sand and rabbit droppings. Personally I don't like the sand so much, it's really hard to keep out of the tent. We explored the beach a little, watched the sunset and then went to sleep. Waking up in the dunes. In the morning we woke up quite late, had breakfast at a bakery in town and left a little after check out time. We cycled further up north through the dunes. This was the most beautiful part of the island in my opinion. After finishing a late lunch along the cycling path it slowly started to rain. We made it to De Cocksdorp at the north end, and since there was no boat had nowhere else to go than back again. We did make a stop at the ice cream farm, which supposedly had the best ice cream on the island, after cycling across the island in less than a day it did not seem that bold of a claim to make. We arrived at the ice cream farm in the rain, and took our sweet time eating the ice cream, while it poured down on our bicycles outside. The ice cream was decent, but had some ice crystals in it, so it was not that great. A quick picknick on the side of the road. Once the rain finally stopped we got back on the bikes and headed for the east coast from where we headed south again. From the dike you could see Vlieland in the distance, but that is all we got to see. 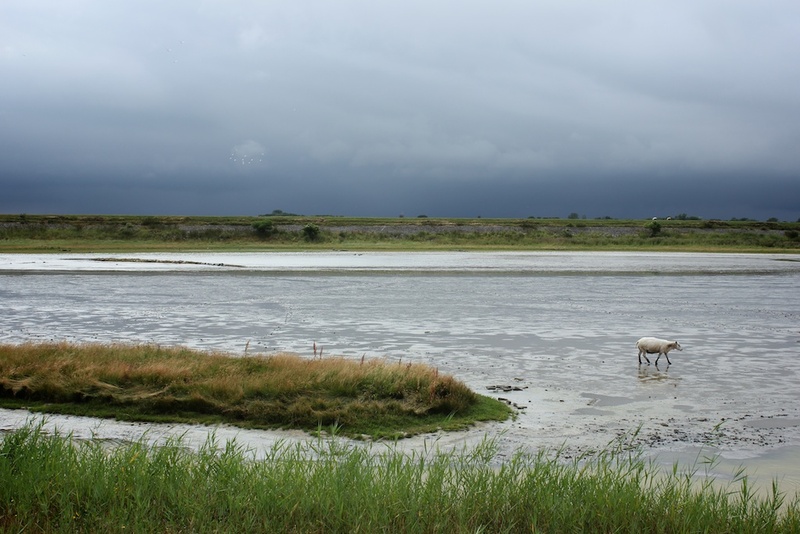 This part of the island was a little bit more bland than the west side, with more farmland and diverse nature. As we were rolling into the town of Oudeschild it started to pour down again, we quickly found a ledge to get some shelter while I helped Mimi cover her backpack with a garbage bag that was acting as a rain cover. A sheep in the mud. After the worst rain was over we went into a local fish restaurant to get something to eat and discussed the next stage of our trip. 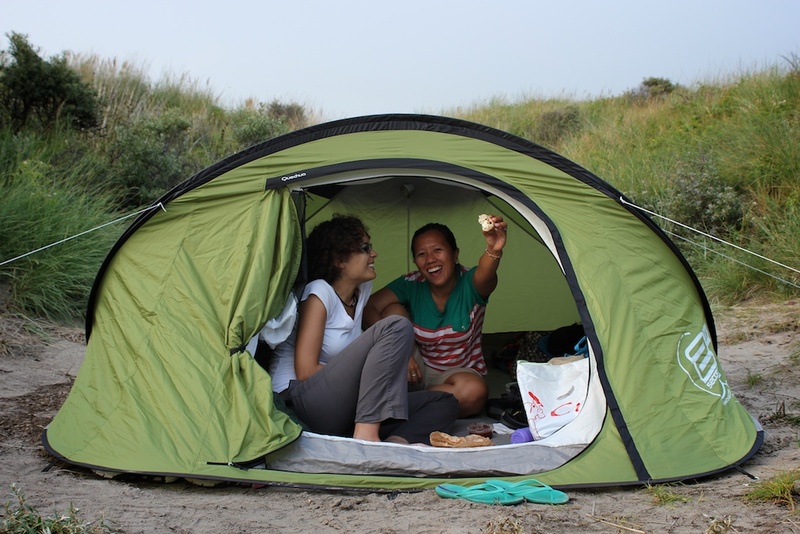 We decided to go back by ferry and called a camp site near Den Helder to check if they had a spot available and decided to go there and then cross the Afsluitdijk and cycle to Fryslân the next day as the wind seemed to be in our favor. By the time we got to the ferry we were quite exhausted. We were looking for a place to buy a ticket, but could not find any. Eventually I found a note saying that there are no tickets being sold on the island, or checked on the return. The ticket for the boat is always a return ticket, as there are very few other ways to leave the island. In Den Helder I had a run in with a seagull that would not get out of the way. At the very last moment it squealed and flew away as my front wheel went over the tip of its wing. At the local super market we got a small disposable barbecue and some food to put on there and headed towards the camping in Anna Palowna. It was about 18 kilometers away, but seemed much longer as we were starting to get tired. I was very relieved when we finally arrived. The camp site was quite small, but the people were incredibly friendly and welcoming. Much of our stuff had gotten moist from being in the rain. With none of the bags being waterproof the pillows and clothing had sucked up the water like a sponge. 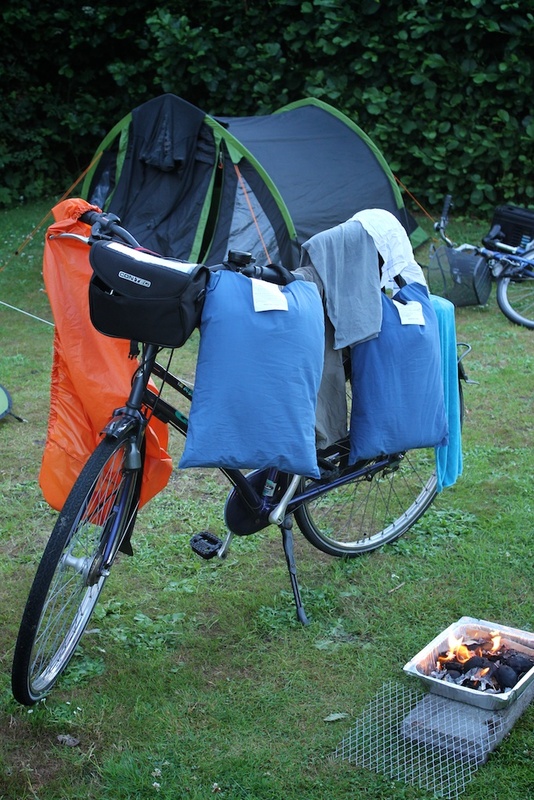 I converted my bicycle into an improvised drying rack, but the sun was disappearing quickly behind the trees. Drying our stuff next to the barbecue mostly made it smell like smoke, but not much dryer. We had dinner outside in the dark. The Waka Waka light that I had brought was very useful. Drying stuff on a bicycle before the sun goes down. That night it stormed. The weather service had given out a "code yellow" weather alert; as far as I know the only one this summer. Our tents were placed in a very sheltered spot, but I couldn't sleep because I was worried that the tent might leak. After a while I had to pee. The camping had some nice facilities and they weren't that far, but I did not want to go outside in this storm. Eventually I was in so much pain that I got the bottle with the widest opening, opened the zipper of the tent and emptied it outside, and then filled it inside the tent without spilling a single drop. In the morning we were greeted by some chickens. 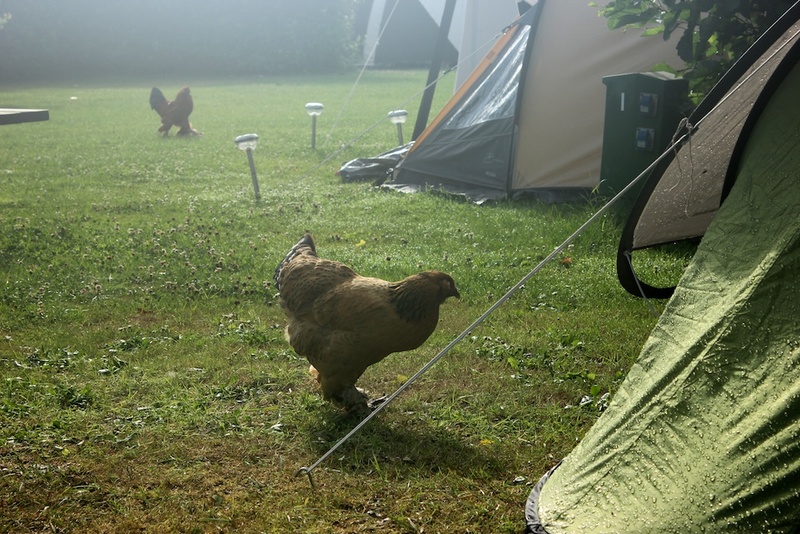 Sunday morning the storm had passed, the tents had not leaked, and we were greeted by chickens walking around our tents. The camping owners treated us with breakfast made with the eggs of previously mentioned chickens. 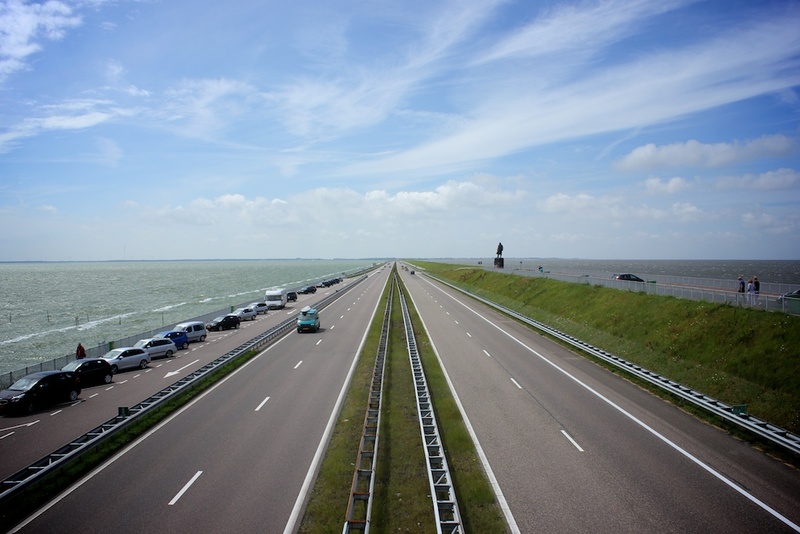 There was a strong wind coming from the south east, perfect for crossing the Afsluitdijk. We were still quite far away from it. This area of the Netherlands is not very populated, but we found a nice place for some lunch and started the trip. It's 30 kilometers of straight road, without any shelter from the elements. The sun was shining very bright, and there is zero shelter on the Afsluitdijk. I had put some sunblock on my face, neck and hands and ws wearing my dessert hat and long sleeves, even though it was a bit warm I could feel the burning sun. Mimi had no sleeves, I put sun block on her arms and shoulders, unfortunately some parts of her back were also exposed, which led to some sun burns that were still visible several months later. With a brief stop at the midway point we reached the other side. We had crossed into the land of the Frysians. The number of campsites here was pretty sparse. After crossing through the small town of Zurich we sat course for Harlingen. Near Harlingen we rolled into the only campsite, and setup our tents in the wind to dry out from last nights storm. It was still early in the day and explored the town and the surroundings. I must say that I was very impressed with Harlingen. I did not know much about it, and thus did not expect much, but it is a really nice town. 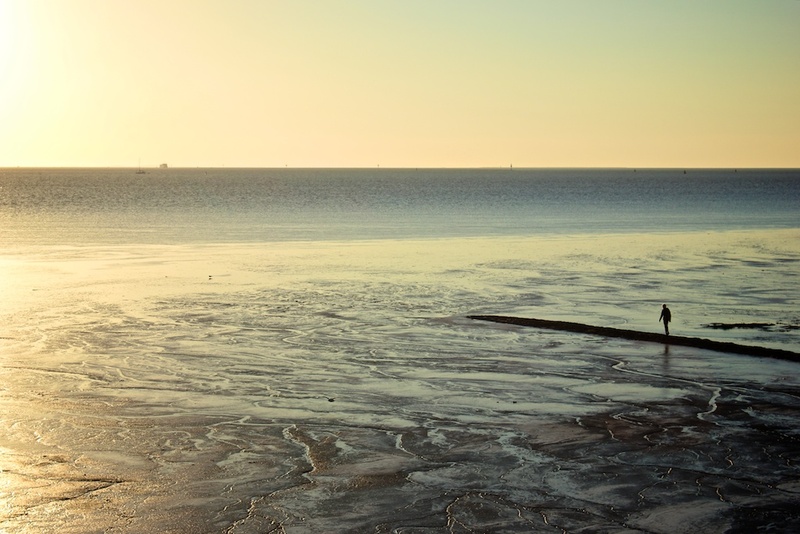 It's a harbor town with some spectacular sunsets overlooking the Wadden Sea. The town itself is very charming with traditional buildings, canals and bridges. After packing up the tent and getting some breakfast from a local bakery we hit the road again. The next stop was the town of Franeker. I wanted to visit the famous planetarium there. Unfortunately we were a bit early and thus walked around and had a drink at the tea room next door. We were not the only ones who were a little early, and as soon as the doors opened there were quite a number of people. 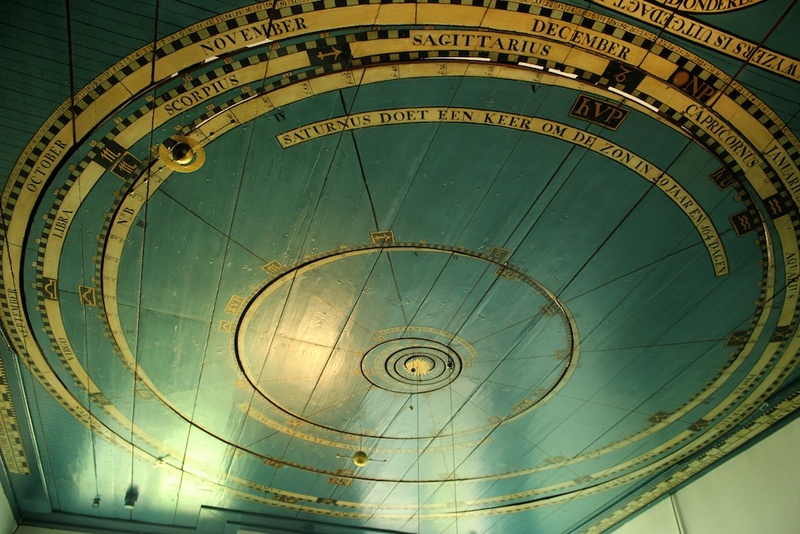 The planetarium was built inside the ceiling of a house and as it moves in real time there is no visible movement, but nevertheless it was very interesting for anybody interested in the history of astronomy. From then on we went straight to Leeuwarden, the capital of Fryslân. We passed the towns of Dronrijp and Marssum from where the skyline of Leeuwarden became visible. The realtime planetarium in the ceiling. It was now getting around dinner time, but as we did not want to miss the train we went straight to the train station and had something to eat from the shops there. Not much later the train arrived; an intercity that went straight to The Hague. Since we had four bicycles with us the sight of other people with bicycles on the platform was a bit unnerving. As the space in the train is limited it usually means a race for finding the bike compartment first. However, we were able to fit in all the bicycles and no bicycles has to be left behind. Waterproof panniers might be worth the investment after all. 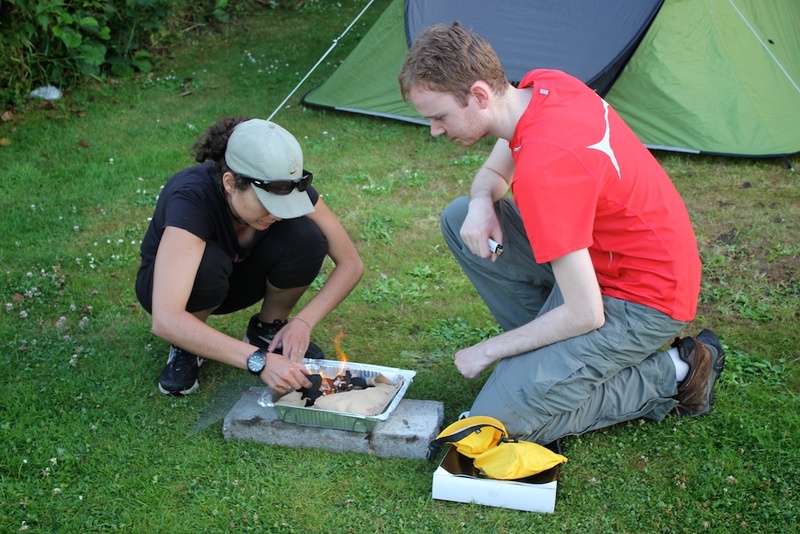 A disposable barbecue is great solution for cyclist when you don't bring your own cooking equipment as Dutch campsites do not usually allow open fires. Apply sunblock very liberally when having loose fitting clothes as the wind will expose parts of the skin that would otherwise not be exposed.